1840 And that's where we end it for the day. A marathon round of matches has given us a good indication of who might make it through to the second round of qualifying - but these are only first leg games, so regardless of how your team has done in the first round of games, there is still hope. The BBC will bring you all the action, when the second leg games of these ties take place in June. 1835 Update from the Sao Tome Sierra Leone game. It was Jair Nunes who got the goal from the penalty spot midway through the second half. 1831 RESULT! Cameroon have grabbed a victory after a frustrating evening in Guinea-Bissau as Eric Maxim Choupo-Moting's late strike gives them a 1-0 win. 1828 RESULT! Algeria have beaten The Gambia 2-1 in Banjul - good result for them. Meanwhile news of how EMC-M scored his goal for Cameroon - he took the ball from a long way out, driblled through the Guinea-Bissau defence and fired home a brilliant solo effort. 1820 GOAL! Cameroon grab a goal right at the last in Guinea-Bissau! Eric Maxim Choupo-Moting is the man with the vital strike just three minutes from time. 1815 We're approaching full time in the final two matches of the day - with Guinea-Bissau still holding Cameroon to a goalless draw in Bissau, which would be a similar kind of result to Nigeria's draw with Rwanda. They've got 5 minutes to go only in that one and Cameroon, shorn of many of their top stars, have not been able to make the breakthrough yet. Meanwhile Algeria are holding on to their 2-1 lead over The Gambia. 1810 More details on that win for Sao Tome over Sierra Leone - it's been very hard to get details, but this comes from the Secretary-General of the SLFA, Abdul Rahman Swaray. Sierra Leone took the lead on 55 minutes through Al-Hadji Kamara, then 10 minutes later the hosts equalised from the penalty spot, before an error from Sierra Leone goalkeeper Christian Caulker gave the hosts a late 86th minute winner. 1803 RESULT Liberia have beaten Namibia one nil in Monrovia. 1800 Reaction to the Nigeria's draw with Rwanda in Kigali from Super Eagles coach Stephen Keshi: "The draw is not what we came for - but I will take a draw home, it's much better than losing and then I will get my team ready for the second game, when they come to Nigeria." He admitted they had been "lucky" not to concede. 1757 RESULT! Finally after a very long time trying we've managed to nail down the result from Sao Tome against Sierra Leone... and it's a 2-1 win for the host nation. So Sao Tome beat Sierra Leone 2-1. 1754 GOALS to report. Algeria bagged an equaliser on 55 minutes against The Gambia through Antar Yahia and three minutes later they've taken the lead, 2-1 to the visitors in Banjul, thanks to Sofiane Feghouli. 1746 It's getting tight in Guinea-Bissau where the home team have had a goal ruled out against Cameroon - the Indomitable Lions would really be expected to win this one, but like Nigeria in Rwanda they are finding it very difficult to break through. 1744 Liberia are still pressing for a second goal against Namibia as Laffor strikes a free-kick from just outside the area and it's saved by Efriam in the Namibia goal. 1732 GOAL! Liberia take the lead against Namibia in the second half in Monrovia. Dioh Williams is the man to put the Lone Star in front after great work from Seknu Oliseh. 1724 It's half time in Banjul where The Gambia are leading Algeria by 1 goal to nil. Meanwhile more news from the completed Chad against Malawi game. We told you during the match that there had been missiles thrown onto the pitch by the fans in N'Djamena - well now we have news that the Malawian forward Atusaye Nyondo was hit by something and hurt. We don't know how serious or otherwise it is. 1720 Halftime in Guinea-Bissau where Cameroon have had the best of the first 45 but have not been able to make the breakthrough. In Monrovia meanwhile Liberia have kept Namibia at bay so far. Bryan Bantam for the visitors was through on goal but denied by Sherman between the posts. 1706 GOAL! The Gambia have taken the lead against Algeria in Banjul with 32 minutes played. It's Modou Ceesay with the goal. And Liberia are back under way against Namibia in Monrovia - still 0-0 there. 1700 It's an even game in Guinea-Bissau so far, where Cameroon will be hoping to make their mark on this early stage of qualfying. Both sides have had scoring chances and the Indomitable Lions have been pressing more but with 23 minutes played it's still 0-0. As it is between The Gambia and Algeria in Banjul, which kicked off at the same time. And if you're waiting for news of Sao Tome against Sierra Leone well - so are we! 1648 Still 0-0 in the two games that kicked off at half-past but as they approach half-time in Monrovia Liberia have gone really close several times against Namiba, with Anthony Laffor cutting in-field from the left and releasing a right footed shot that just scrapes by the outside of the near post. And that is half-time. 1643 Reaction to Tanzania's 1-1 against Mozambique from Taifa Stars coach Jan Poulsen: "We were the better team in the second half - we should have scored again but we didn't and that's football. But now it's half time [in the tie at] 1-1 - and when we walk on the pitch in Maputo we can win the match." 1640 They're underway in Guinea-Bissau against Cameroon and in Banjul where The Gambia are playing Algeria. 1629 RESULT Congo Brazzaville have beaten Uganda 3-1. 1626 RED CARD for Uganda's Tony Mawejje for a second bookable offence, and the crowd in Congo Brazzaville are celebrating even before the final whistle.... they still lead 3-1. 1624 Oh it's close again in Monrovia, as Liberia's Sekou Oliseh heads wide from even closer. Just two yards out! But still 0-0. 1618 Meanwhile Uganda have gone close to pulling one back against Congo-Brazzaville but Emmanuel Okwi fired wide. 1616 This reaction to Zimbabwe's defeat at the hands of Burundi on SMS: "My name is Zongoro Shandirai. I am really dejected because Zimbabwe lost 2 -1 to Burundi. The Asiagate ghost has struck again. Cry Zim." Zimbabwe have banned their national team coach and nearly 100 players in the wake of the match-fixing scandal there. 1613 GOAL! Congo Brazzaville have stretched their lead over Uganda and they go to 3-1 up. 1611 They're playing in Monrovia where Liberia are taking on Namibia, and the home team have already had a great chance to take the lead with Solomon Wisseh heading wide from only 6 yards out. 1605 GOAL! The penalty is converted and Congo Brazzaville go 2-1 up against Uganda. It's Mayende who scores by sending the sub-keeper the wrong way. 1602 PENALTY! Congo Brazzaville are awarded a spot kick against Uganda. It's 1-1 at the moment and time running out! 1600 Some anonymous reaction to the big win for DR Congo over Seychelles today: "The way DR Congo is playing, I will not be surprised if they are the next Zambia in 2013 Afcon." 1559 RESULT Chad have beaten Malawi 3-2 in N'Djamena but the Flames will have hopes of overturning that when the second leg comes around in June. 1555 Confirmed RESULT! DR Congo have beaten Seychelles 4-0. And it's getting tense in Congo-Brazzaville where Uganda are facing a bit of an onslaught. "The crowd has now swollen to about 10,000 people; Dhaira punches to safety Ondama's well-loaded shot for a corner kick that later saw Ondama's header kiss the woodwork!!" says Andrew Luwandagga. 1549 RESULT! 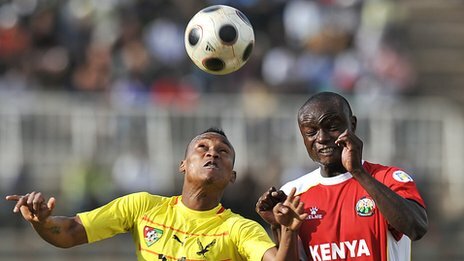 Kenya have beaten Togo 2-1 in Nairobi. Good result for the Harambee Stars - especially given the problems with McDonald Mariga in the build up to the match. 1541 Time running out for Togo in Nairobi, where Kenya are leading 2-1 still. Meanwhile they're back underway in Congo-Brazzaville where it's 1-1 between the hosts and Uganda. And it sounds like it's a thrilling encounter as andrew Luwandagga describes "attack after attack" by the Congolese being staved off by sub keeper Dhaira. On the subject of the keeper, this on the SMS from Solomon in Uganda: "Sad to read that Onyango is injured. However Abbey Dhaira is equally good, he helped us Lift the CECAFA for a record 11th time." 1539 The reaction to Nigeria's draw with Rwanda is already coming in by SMS on +44 77 86 20 20 08. Kweku in Canda says it's calling them the "Super" Eagles that's the problem - they should be called simply the "Green Eagles" he says. 1533 RESULT! Burundi grab the early advantage in their tie with Zimbabwe as they win 2-1 in Bujumbura. 1527 GOAL! Burundi go back into the lead at home to Zimbabwe as Valery Nahayo strikes for the home team as they go in to 5 minutes of stoppage time at the end of the game. And another GOAL! as Malawi keep their hopes alive in a thrilling encounter in N'Djamena against Chad as Spain-based Robin Ngalande - on as a sub - plays it on to Atusaye Nyondo, who scores to make it 3-2. 1525 Half-time in Congo-Brazzaville where it's 1-1 between the hosts and Uganda at the break. The BBC's man monitoring the game, Andrew Luwandagga, says Congo were being booed by their home fans... but there's a long way to go. Meanwhile GOAL! DR Congo further stretch their lead as Basilwa gets their fourth. 1523 GOAL! Kenya go back in front at home to Togo with Allan Wanga the man to make it 2-1. 1515 GOAL! Chad have extended their lead over Malawi with a secodn strike from Djime Leger to make it 3-1 in N'Djamena. A failure in the Flames defence, reports Frank Kandu. 1513 The fans in Kenya are expecting more fireworks at the Nyayo against Togo. This by SMS on +44 77 86 20 20 08 from David: "Togo will be beaten. I expect 3:1. The togolese seem determined to leave with a point but they are in for a big surprise." But no fireworks yet says John Nene - an hour gone and still 1-1. 1508 Should have mentioned this a bt earlier but with all the action I got a little side tracked. Victor Moses has been brought on and thus wins his first cap for Nigeria and is officially no longer available for England. At last! 1507 Time is running out in Kigali for either side to take an advantage from the game between Rwanda and Nigeria. The Super Eagles will surely be happier with a draw but will their fans be satisfied? Two narrow chances for Rwanda go begging and the Amavubi captain Olivier Karekezi is booked for a dive and then back-chatting to the ref. Meanwhile news from Congo-Brazzaville where visitors Uganda have been forced to replace their keeper Onyango, who injured himself taking a goal kick and has been taken off with Abbey Dhaira coming on in his place. 1502 Its heating up in Kigali, where Dady Birori has fired over the bar for Rwanda and Yakubu Ayegbeni has had a goal ruled out for offside for Nigeria. 1500 Halftime in N'Djamena and a thrilling finish to the opening 45 as Malawi pull level through Atusaye Nyondo but then Chad take the lead again in stoppage time through Djime Leger. Drama! 1458 GOAL! Zimbabwe have pulled level in Burundi with a goal from Knowledge Musona on the hour mark. And another GOAL! Mike Serumaga has equalised for Uganda in Congo Brazzaville. 1456 GOAL! DR Congo have stretched their lead against Seychelles with another goal from Alain Kaluyituka makes it 3-0. 1455 RESULT Ethiopia and Benin draw 0-0 in Addis Ababa. Ethiopia had a host of chances - they were through on goal no fewer than SIX times but each time Fabien Farnolle in the Benin goal stopped them. He plays for Clermont-Ferrand in France Ligue 2. 1454 First substitutions in the Rwanda Nigeria game. Osaze Odemwingie comes off to be replaced by Ikechukwu Uche for Nigeria and Hussein of Rwanda is replaced by Bokota Kamana for Rwanda. Still 0-0, 10 mins gone in the second period. 1447 RESULT Tanzania have drawn 1-1 with Mozambique. And GOAL! Burundi take the lead against Zimbabwe. Mavugo Lody gets the goal in the first minute of the second half. 1446 Half time in Nairobi where Kenya and Togo are locked at one-apiece. Meanwhile with 3 minutes left to play it's 0-0 in Addis Ababa where Ethiopia are taking on Benin. 1444 GOAL! Chad take the lead against Malawi as France based Labbo Mahamat gives them the lead on 38 minutes with a well taken shot from outside the box, says Frank Kandu. Meanwhile there are 5 minutes of stoppage time in Dar es Salaam as Tanzania and Mozambique both strive for a winner. 1442 GOAL! Togo draw level with Kenya as Razak Boukari heads home with 6 minutes to go before the break. The home fans aren't happy with the referee but the goal stands. 1-1. 1440 They're back underway in Kigali, where Rwanda are holding Nigeria 0-0 so far. On +44 77 86 20 20 08, Stella writes "with this kind of display by Super Eagles there was no need to sack Samson Siasia. So disappointing!" 1435 GOAL! Congo Brazzaville take the lead against Uganda just a few minutes after kick-off to get their campaign off to a brilliant start. Fabrice Ondama is the man with the vital strike. 1434 Two near misses! In Nairobi, Togo almost grab an equaliser through Segbefia Prince of Auxerre but he hits the side netting of the Kenya goal. And in Dar-es-Salaam, Tanzania John Bocco only has to keeper to beat but shoots straight at him. 1432 Chad are still drawing 0-0 with Malawi but the BBC's Frank Kandu reports that its getting bit more nerve-wracking for the Flames: "Another blunder at the back by Malawi's James Sangala could have resulted in an own goal but the deflected shot missed target by an inch. Malawi are under pressure." 1431 Kenya have a goal ruled out for offside after Dennis Omino had put the ball in the net from yet another corner. Just over half an hour gone in Nairobi and it's all Harambee Stars against Togo. 1425 GOAL! Kenya take the lead against Togo. James Situma heads home the opener in the 22nd minute from Titus Maluma's corner. 1424 It's half time in Bujumbura - where Burundi are drawing 0-0 with Zimbabwe. There are some reports doing the rounds about goals in the game but our man monitoring the match in Burundi says its certainly 0-0. 1420 Kenya are pressing against Togo and have forced the first corner of the game but neither side has had a great chance as yet. 1416 News from Seychelles against DR Congo - where the visitors are two nil up going in to half time with goals from Alain Kaluyituka and Tresor Mputu Mabi, who is playing despite the recent death of his elder sister. 1413 Chad and Malawi are underway in N'Djamena. Chad have made a positive start and could have taken the lead in the third minute but a deflected shot was hit the cross bar and bounced clear. 1408 Confirmed result. Cape Verde have got a tremendous victory in Madagascar, winning 4-0 with goals from Ryan Mendes, who opened the scoring after 11 minutes; Dady - who doubled the lead with 6 minutes to go to the break, Fernando Varela made it 3-0 on 77 and four minutes later Tony Verela wrapped up the win. Madagascar had a man sent off in the first half. 1407 We've got some team news from Cameroon ahead of their game in Guinea-Bissau later today - and coach Denis Lavagne has dropped veteran keeper Carlos Kameni to the bench, with Ndy Assembe starting in his place. 1405 Close again from Tanzania! Bocco's shot is fumbled by the Mozambique keeper but Barnabas cannot force home the rebound and it remains 1-1. 1403 Kenya and Togo have kicked off in Nairobi, with Harambee Stars dictating the early pace in front of about 15000 fans. 1400 They're back underway in Dar-es-Salaam with Tanzania and Mozambique tied at 1-apiece. Tanzania coach Poulsen has brought on star winger Mrisho Ngasa from the bench in place of Nizhal Khlafan. 1358 Confirmation that Togo will be without Emmanuel Adebayor for their game against Kenya in Nairobi. The BBC's John Nene at the ground says coach Didier Six is very disappointed. 1354 Double booking for Rwanda as Hussein Mbanza and Jean Baptiste Mugireneza go into the book. 1350 It's goalless in Kigali as well between Rwanda and Nigeria but Super Eagles fans hoping for an instant bounce back under new coach Stephen Keshi are having to wait for a bit. They haven't created any clear cut chances so far and look far from confident at the moment, our man in the ground reports. 1345 Goalless in the game between Burundi and Zimbabwe so far with 15 minutes gone. 1338 GOAL! Tanzania equalise against Mozambique through a beauty from Mwinyi Kazimoto with a powerful strike from 30 yards out. 1330 Rwanda against Nigeria has kicked off in Kigali. Victor Moses is on the bench. Yakubu Ayegbeni is back up front in the first competitive game for the Super Eagles under new coach Stephen Keshi. Joseph Yobo is captain and becomes the country's most capped player. 1328 Close from Tanzania! Vincent Barnabas gets into a shooting position but puts it just wide. 1324 The BBC's Frank Kandu, keeping across Malawi's game in Chad, says that's a radically changed line-up from Flames coach Kinnah Phiri, with four locally-based players in the starting eleven. John Banda up front means no place in the first team for Atletico Madrid's Robin Ngalande with Atusaye Nyondo, also up front, is making his first start for a long time. 1319 GOAL! Mozambique take the lead against Tanzania! Cleusio Bauque runs through the Taifa Stars defence and fires home unchallenged to put the visitors in the lead. 1312 Close for Tanzania! John Bocco is through on the keeper but can't bury the shot and it's punched clear by Joao Rafael in the Mozambique goal. 1308 The BBC's Emmanuel Muga in Dar es Salaam is at the Tanzania Mozambique game and reports that the visitors have started the most brightly with Jeremis Sitoe going close in the early stages. 1305 Mozambique starting line up from coach Gert Engels. 12 Joao Rafael 3 Edson Sitoe 4 Zainadine Junior 6 Eduardo Jumisse 7 Jeremias Sitoe 10 Elias Pelembe 11 Clesio Bauque 13 Francisco Muchanga 14 Stelio Ernesto 15 Francisco Massinga 16 Almiro Lobo. 1255 Tanzania and Mozambique have kicked-off in Dar es Salaam - it's the second game of the day to get going. 1252 Liberia caretaker coach Thomas Kojo - who's only just taken over - tells the BBC that their home game against Namibia is a very big challenge. "It's a big challenge for me and the technical staff," he said. He says he's only been given the job for this one-off game - after the sacking of Roberto Landi. 1238 Another friendly taking place much later today is the game between Ghana and Chile in the USA. It could prove to be Ghana coach Goran Stevanovic's final match in charge - and the Black Stars have been hit by a number of injury withdrawals as well. And today we've had news that the BBC African Footballer of the Year, Dede Ayew, is going to postpone an operation until the end of the French season, so he can carry on playing with Marseille. That could have an impact when it comes to the start of Ghana's World Cup qualifying campaign for 2014. "If I have an operation now, my season is over - I will have to grit my teeth," Dede said. 1232 News from the Madagascar versus Cape Verde game and it's brilliant news for the visitors, who are leading 2-0 at half-time. 1230 Ivory Coast are playing a friendly international later against Guinea but they will be missing many of their best players. Didier Drogba had already pulled out through injury, as had Kolo Toure. But no they've been joined on the sidelines by Kolo's brother Yaya, as well as Salomon Kalou. 1220 Madagascar against Cape Verde has been underway for a while and so far there are no goals reported - although information out of Antananarivo is rather scarce at the moment. 1215 News from Tanzania's game against Mozambique. Tanzania coach Jan Loulsen has sprung a surprise by starting with Vincent Barnabas on the wing - who hasn't been in the side for seven years - ahead of Mrisho Ngasa, who's been a key man so far. 1205 As far as the friendlies are concerned, Egypt's game against Niger could well be significant - because it will certainly feature the world's most capped international player, the remarkable Ahmed Hassan. But exactly how many caps he will have is still unclear. It'll either be 179 - which will take the record - or 180, depending on whether a friendly game which Egypt played against a Kenya u23 side the other night is counted. Hassan himself is unsure... "Whatever the story, I will play against Niger to remove any doubts regarding who is the most capped player," he told Reuters news agency. 1200 Most of the matches are coming later, so there's still news coming through about who may or not feature. And we're told that Togo's Emmanuel Adebayor is unlikely to make it into the team for their game against Kenya. "It looks like we'll have to do without him," Togo coach Didier Six told a French radio station. We'll keep you posted from Nairobi. 1155 Welcome to the BBC's coverage of today's 2013 Africa Cup of Nations qualifiers. The race to South Africa gets going in earnest today, with 13 games taking place across the continent as the teams who did not make it to the 2012 competition play off for the right to go into the hat with those that did. These are first leg matches - the second legs will be played in June. The games and kick-off times - not all of them certain - are below. There are also a range of friendly matches, which we'll keep you up to date with.